I submitted “Extra! 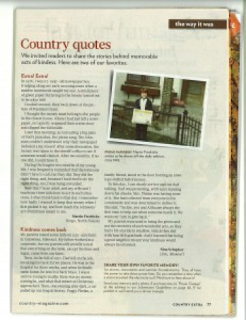 Extra!” (see earlier post on this blog) to Country Extra magazine, which was soliciting personal, small-town stories featuring acts of kindness. The magazine’s editors shortened the piece considerably and printed it in the November/December issue. I received my copy in the mail last week, along with my free, full-size dinner triangle. Ah, yes, freelance writing will make you rich beyond your wildest dreams…. Next Next post: Feeling Blue? Get Yourself Some P!nk. Or Just About Any Other Color.